I was up and out by 7am this morning for a run up on the Gleniffer Braes. The weather was fine and I felt good the whole way round. Katrina, Jonny, Frances and I are running 25miles on the whw route tomorrow starting from Drymen so I wanted to push it a bit so my legs would be a little tired tomorrow. I’m not sure if they will be as I’m feeling really good at the moment. I was really happy with my run and encouraged with my running at the moment. It’s good to be able to run at that steady pace with my heart rate averaging 133. I don’t tend to get many comments on my blog anymore but when I do they are good ones! Robert Osfield is a regular commenter (along with Debs C-M who by the way has posted an excellent report of her recent Lakeland 100 race …. well worth a read!). I have also used my HR monitor as guide to pacing in training and racing, as well as looking at reading from my HR monitor to gauge fitness. What I have found useful is to record the calories per mile reported by my HR monitor for different routes, rather than looking too specifically at the HR reading. Using calories per mile allows one to compare running at different paces for the same route. I’ve also done work to normalize for HR drift and hills so I can compare progress between completely different runs. It requires a little bit of spreadsheet processing to get the results. One thing I’ve picked out from all the stats is that it’s not just HR at a given pace that is important to gauge fitness, but what happens with HR drift during long runs. This year my HR for given pace for short runs is no better than last year, but for runs of two hours and more I see much less HR drift – so for a constant HR run my pace would not slow so much. For my Devil race this year I used my HR monitor as a guide, aiming to keep my HR below 160 all the time (15 below LT threshold). This meant walking steeper hills more gently than I would have otherwise, but also encouraged me to run gently climbs that I would have walked otherwise. Early in the race this meant I was overtaken lots during the hills, but re-took the places on the descents. By the end of the race I was overtaking on hills and descents and finished really strong. My % splits turned out to be very close to that of this years winner and also previous years winners – suggesting that they run at an even effort as well, but also I was able to pace like the best of elite’s with no more skill that occasionally checking my HR monitor. I would certainly recommend trying out pacing hilly and longer runs using your HR monitor and consider using it when racing. The key is picking what HR range will work best for you for the distance you are racing. As I guide for the Devil I used my average HR during previous races. I’ve had a look at overall calories burnt on runs so assume I just divide that miles run to work out calories per mile? Hi John, I’ve kept coming back to this article over the last few days as my motivation for running slowly returns (injured with labral tear). Can you let us know if the 130bpm is relative to your maxHR or your LT please and if so what % it is of either? Robert, as always indepth and intersting. Can I ask please your thoughts on ultra running; are you suggesting that one should undertake such a challenge at just above 90% of LT and if so do you believe it would be worth running LSD’s at this intensity in training? I’m not sure what my maxHR is at the moment. The only time it’s been worked out properly is when I did a fitness test at Hampden in 2009. Then it was recored as 172. So 130 would be 75% Maybe that’s a bit high for a recovery run? My heart rate at my Lactate Turnpoint was 157 so 130 would be 84% of my LT. I know Robert is planning to write a blog post on what he has learnt on running ultras by heart rate so I’m looking forward to reading that. This entry was posted in Glennifer Braes, Heart Rate. Bookmark the permalink. If you don't have TotalCalories you will be able to estimate this from your HR and weight. Search online for different formulas various people/companies have come with it. My HR monitor reports total Calories and average HR so I use this in my own computations. My mileage and height gain/descent I get from my phone's GPS running app. The average HR you can sustain changes with the distance you run, so for a 10k to half marathon you'll be around 100% Lactate Threshold, as you go further it'll get lower. 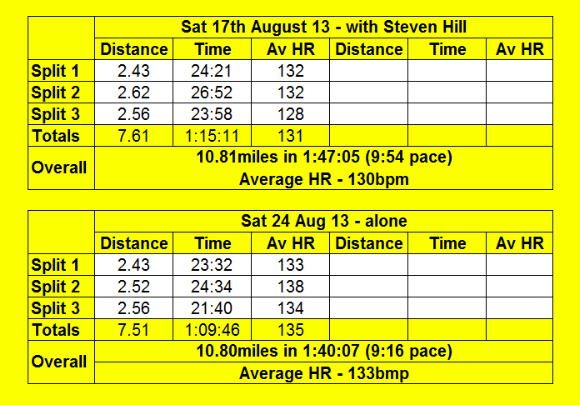 This years Devil (42 miles) my average HR was 87% of my LT, last years Fling (53miles) my average was 86% of my LT. I've done the Lochalsh Dirty 30 four times now and my HR 90 to 94% of my LT). If you have logged HR for different races try plotting them against time and distance to see what looks to work for you. This way you might be able to estimate what average HR is likely for a given time or distance. Personally I wouldn't recommend using % of max HR, and for sure would never use the 180-Age formula's as both are really inaccurate at estimating what HR's you'll see when running different length races. Lactate Threshold isn't perfect but it's probably the most reliable value to use for a distance runner. There are various articles online that give suggestions on how to find out your HR at Lactate Threshold so go have a search. As for training vs racing HR's, they are rather too loosely correlated to make are hard fast rules by. When racing adrenalin boosts the HR, also when doing ultra's HR drift can be significant so the average HR for a given pace over 5 hours can be much higher than when running the same pace for 1 hour. Temperature, Food/Fluid consumption before/during, Stress, Stimulants etc. all have an effect on HR too. Given these differences I'd recommend training by pace/intensity and use your HR monitor as a general guide rather than a exact measure. For race day I'd suggest looking at your HR average for similar races that you've done and use these as guide. Using your own results as a guide is really important as we all have our own mix of genes, diet and training history. How well you run your race also has a big effect – if you struggle in the second half due to dehydration/low energy/cramp/fatigue etc. then you'll slow and average HR will be lower. If everything goes perfectly then you might well find you can sustain a higher HR thought the race than you could a bad day. Conversely on bad days it can be that your HR just stays high even a low pace. If you make a habit of tracking HR during training and races you can start to see patterns emerge. We all will respond in broadly similar ways but the precise numbers will be very individual. Also relationships change over time as well, this year I've seen my HR drift become less significant, this is very welcome sign. The effect on my results is that my average HR for a given pace when doing a long run is lower, but also if running against a constant HR my pace doesn't slow as much as it once did. My training has been heavily compromised by injury this year so the most likely explanation for this improvement is change in my diet from high carbs to moderate carbs and higher fat. One thing I would recommend is training with HR when doing long training runs when encountering hills. It's real eye opener just how easy it is to push yourself close to Lactate Threshold when going up a gentle slope a bit too fast. A HR monitor can give you early warning to back off. Once you've warmed up, to be most efficient you'll want to keep your HR as even as you can get over the duration of your run. This might mean learning to walk sooner than you might expect, or even walking slowly if the hill is steep. I'd guess that 90% of ultra runners attack hills too hard and waste precious glycogen stores. this stuff is pure gold, thanks guys. Listen I've been doing some running for about 5yrs now and I've read a lot of books. God knows how this stuff has passed me by. Anyway, I did a LT test not long after that post John subsequent to what Robert was going on about. My LT is 173 which was a big surprise given the fact that it represents 95% of my MHR – my previous tool for training. Needless to say I am rethinking my entire training strategy. 5 yrs its taken me to get this far. The only problem is that all the advice I find seems to indicate that most peoples' LT is closer to 80% of the MHR – which is where most of the corresponding training advice fits in. I must not be normal! Anyway, I think its time to be braver with my training. One thing I am also going to do is cut down my mileage. Things are going to be far more specific from now on. the other problem is that I have this labral tear. I'm told you CAN run with it but you have to be very careful not to overdo it. Presently, I am running about 1minute slower per mile than I was used to pre-injury. It's slow progress but at least its something. Robert, John, thanks again. One of the best blog articles I've ever read.